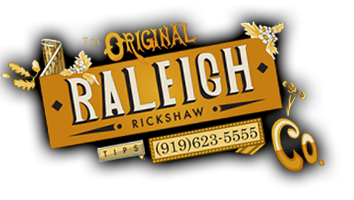 Historic Rickshaw Tour for Large Groups - The Raleigh Rickshaw Co. This is our largest tour, great for corporate or team building events. You and your group will learn about the history of Raleigh with your own personal tour guide! Our knowledgeable tour guide will bring the “The City of Oaks” to life as you roll up to our famous (and sometimes hidden) landmarks in style and comfort. There’s so much to see and learn – and who ever thought you could have such fun in the process? Find out which U.S. president was born on a kitchen table just a few steps away from our State Capitol. Who embezzled $68,000 from the North Carolinians in the mid-1800’s? What North Carolina county was the first to declare independence from England? Why do scientists from around the world come to see the “Acrocanthasauras” at the North Carolina Museum of Natural History? What historic northern city is Raleigh patterned after? Who scrawled their names in the sidewalk bricks in front of the Governor’s Mansion…and why? And what’s the story about that giant acorn? All these mysteries – and many more – will be revealed with knowledge and humor on our one-hour Historic Tour of Downtown Raleigh. Tours begin in front of the City Museum located on Fayetteville Street. Arrangements can be made if your group needs to be picked up from another location (check with us for rickshaw boundary areas). Each rickshaw can support up to two adults and one child. See package details for discounts in the drop down menu to add additional bikes.